Start with your sink and dishwasher. Empty your sink and dishwasher before washing anything else in your kitchen. This is because you’ll probably need water to clean your dirty cleaning cloths, and you don’t want to add more mess to an already piled up sink. In addition, clearing out your dishwasher first allows you to load dishes and cooking tools right after using them, providing for an easier cleanup. Make sure to wash your sink after you wash the dishes. Always clean countertops. You might be shocked to learn that counter tops can actually gather more dirt and germs than your kitchen floor. Clean your counters with an effective cleaner every day to keep away stains and prevent germs from spreading. Use a microfiber cleaning cloth to wipe away dust and liquid spills, and wash the cloth immediately after every use. Counter tops must be kept clean at night so that they don’t attract insects and vermin. Mop the floor regularly. Kitchen floors are understandably dirty since they gather crumbs, spills, and dirt every time someone uses the kitchen. You’ll want to keep your kitchen floor in check, especially if you have children. Mop the floor every time something spills to avoid ants and cockroaches from feasting on the fluid or its residue. Before you sleep, mop it again to keep it spotless and fresh looking in the morning. Remove stains. 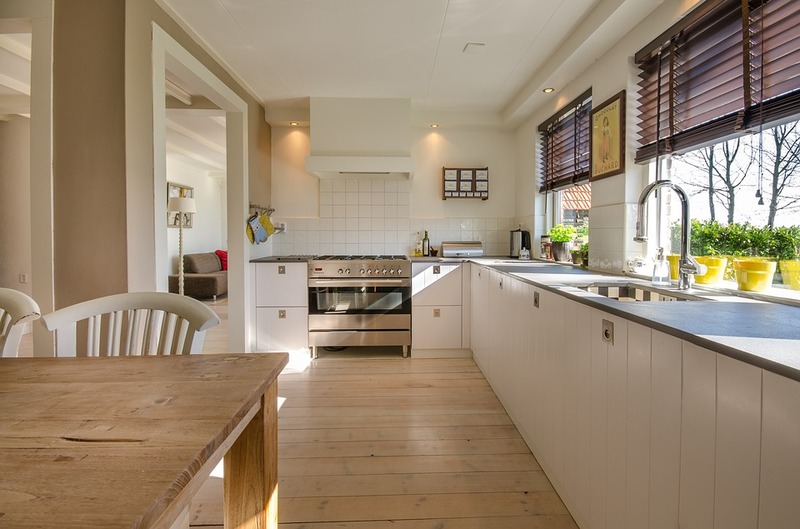 Surfaces such as counters, walls, and floors are never safe from unsightly stains and spills, and they can give your kitchen a nasty look for years. Prevent stains by cleaning up spills and fluids immediately. You can also use a mixture of water and baking soda to deal with existing kitchen stains. Organize your cabinets. In order to make your kitchen more conducive to cooking, you need to organize your tools and supplies. The first thing you have to do is to pack up or give away items that you don’t use often and discard items like leaky containers and cracked mugs. Next, group things according to use. This way, you’ll have an easier time looking for the tools, utensils, and ingredients you need. Clean your refrigerator regularly. Once a month, check the contents of your refrigerator and throw away expired items. 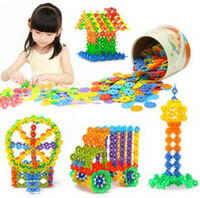 Wash its removable parts and use a dedicated toothbrush for the grooves or wheels. Wipe down the walls with water and baking soda, too, to get rid of grime and discoloration. Rinse or wipe jars and containers before returning them inside your refrigerator. Arrange your pantry. Like your refrigerator, check your pantry regularly for expired items and wipe or rinse grimy jars and containers. Set aside items for storage and keep everyday ingredients within easy reach. Polish your cookware once a month. Clean burn stains and rust spots from your pots and pans. Boil water in them to remove food stains and brush the outside with water and baking soda. Sharpen and polish your knives regularly to keep them sharp, clean, and shiny as new. Use lemon slices as a food-safe cleaner for your knives. Oil your cutting boards. Oiling your cutting boards only takes less than five minutes but this little task can save you a bit of money. Well cared for cutting boards do not need to be replaced often. Mineral oil is a popular and affordable choice for oiling wooden boards, plus it’s also food grade so it’s safe to use. For best results, apply the oil in the evening and leave overnight. Wipe away excess oil in the morning. Use the right size for trash cans and recycling containers. Make sure these are big enough to accommodate the volume of trash that you accumulate every day. After all, you don’t want to replace your trash bag more than once a day or let your excess trash pile up on your kitchen counters. After a thorough cleaning session, consider adopting daily cleaning habits that will help you keep your kitchen looking its best. Dealing with messes immediately instead of letting them pile up can go a long way in improving your kitchen’s look and atmosphere. Follow these tips consistently and you might even find yourself looking forward to spending more time in your kitchen. Easter is almost here and it’s the right time to start thinking about the table decorations for the occasion. Easter brunch is a tradition in many homes and most people like to take it easy and casual, and sleep in for a bit longer, so having brunch instead of a formal dinner is a perfect solution. Deciding on this year’s theme might pose a challenge, especially if you want to keep it a bit classy for the adults, but still colourful and fun for the kids in the family. 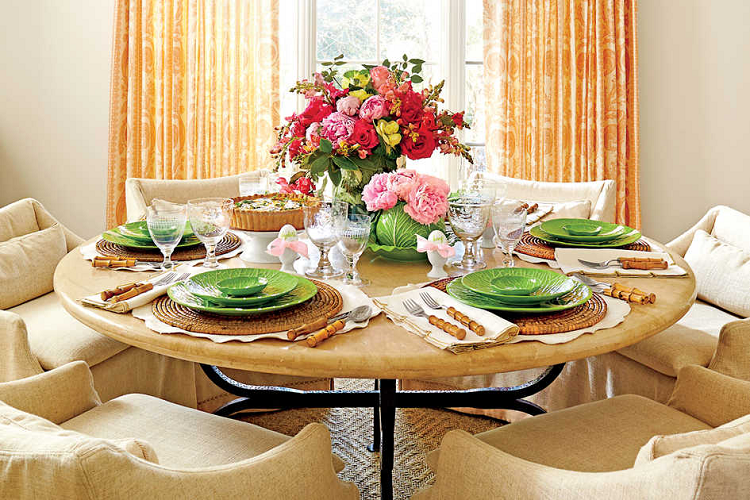 Here are several suggestions how to decorate your Easter table and offer something for everyone. If you’re one of those families that like to put the kids at their own table and let them create their own fun, then that leaves you with enough room to upscale the decoration at “the adult table”. You can rarely go wrong with an elegant and classy style. For instance, a combination of marble and delicate floral Easter motifs is very stylish. You can create this look by mixing and matching marble tableware, a touch of black and white confetti sprinkled randomly and a gorgeous floral centrepiece that will add the colours and scents of spring. Nothing says class and elegance more than a black and white combination. Consider setting your table with beautiful Robert Gordon black and white plates and bring it all up a notch by adding silver or gold accessories, such as napkin rings, egg holders, cups and dessert spoons. Finish it off with a dip bowl holding an assortment of chocolates wrapped in gold foil to fit with the rest of the design. 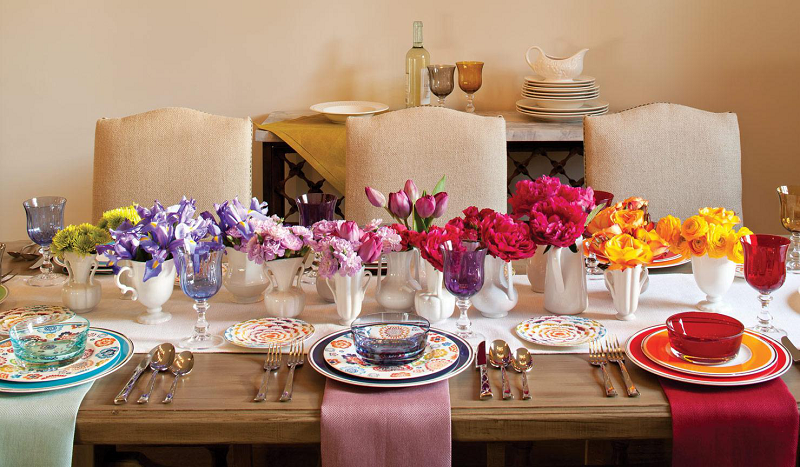 By Easter time, most people feel sick of winter and are yearning for the colours and smells of spring, so bring some fun and colour to your table styling. Break away a bit from the tradition and get creative with what you have in your home, and your kids could contribute with their own ideas. You can use floral wrapping paper and cut it up to use it as a disposable tablecloth and make a big statement at a very small cost. Lay the table with blue plates that will pick up on the tablecloth colours and some pastel mugs. Tie it all together with white side plates and shiny silverware. Leave it to your kids to add an egg holder with a monogrammed Easter egg for each guest and a bright, yellow chick or a cute white bunny next to each plate to finish the setting. There’s something particularly sweet about a country garden party theme for Easter, especially for the kids’ table. They will adore a cotton candy colour palette, with a chequered tablecloth, paper doilies and tiny cut-out flags that you can all prepare together before the guests arrive. Get your kids to pick spring flowers such as garden roses, tulips and daisies, and arrange them casually on the table. Dress the table with some patterned ribbons, colourful confetti eggs, Easter candy jars and place bunny cut-outs with kids’ names on them, colourful Easter-inspired paper plates and cups, so the kids can fully enjoy the Easter fun without the worry of breaking anything. A natural woodland theme is one of the most common Easter table settings and is suitable for both adults and kids. The best thing about it is that it doesn’t cost much and you can easily make it together with your kids just by using things you have in the house and your backyard. As a centrepiece, you can use your kitchen wood slice board and place a wicker basket filled with twigs and spring flowers that will make a wonderful nest for colourful Easter eggs. Go with white, green and blue colours for your crockery and add pastel plaid napkins. And, as a finishing touch, put scented candles and faux moss bunnies around the centrepiece. 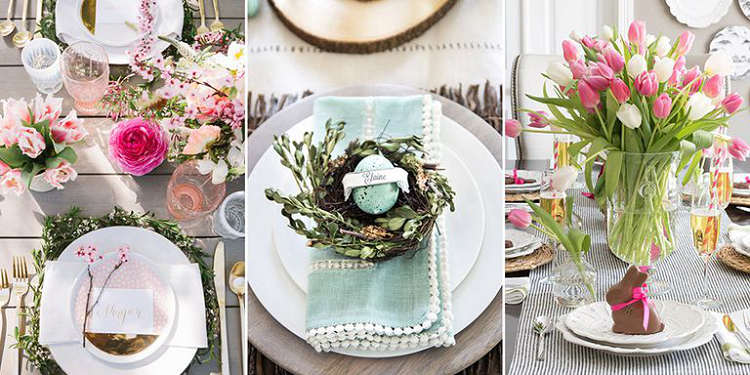 Easter is a time of celebration and joy, and whether you’re having an elegant party or a casual country brunch gathering, these table setting ideas will help you create a lovely, warm and inviting ambience and impress your family and guests. The kitchen is usually the busiest room in the house, and as such, should be well organized and nicely decorated. However, this is not as easy as it might sound, especially if you have children, since you should keep them in mind when designing your kitchen. They should be able to use it as easily as you are while staying safe from all the hazards. So, if you don’t want to worry about your kids using the kitchen without you or be called for help every time they need something in it, here are some family-friendly ideas you should consider. We all know that no matter how many times we tell our kids not to run around the house, they still forget – and that’s when they can hurt themselves. In order to reduce that risk, add corner bumpers to all the sharp edges around the kitchen. You should consider using door stops as well, since kids are known to get their fingers caught in the doors, and you definitely want to avoid that. Having a blackboard in the kitchen can help you keep everything organized. You can use it for writing down your grocery list or your favorite recipe, for telling your family members that there are some food leftovers in the fridge, or simply for reminding each other that there’s no more milk. You can even get creative with it and write down some inspirational quotes and poems, or you can let your kids show their artistic skills by letting them draw on it. The kitchen islands are great for families because they are large enough for both you and your children to use at the same time, and they can be designed to fit all your needs. For example, you can install drawers or shelves on one side of the island for the cups and glasses, so your kids can help themselves without bothering you. You can also install a microwave drawer at one end of the island, so they can reheat their food without disrupting others who are using the kitchen at the time. Just don’t forget to keep an eye on them whenever they are using the appliances. Organizing your food in the fridge will help your children find what they need without having to move any food and risk accidentally dropping something (like eggs) on the floor while looking for their drinks or snacks. All you need to do is simply dedicate a couple of the lower shelves just for your kids. If you like this idea, the kitchen-appliance company Maytag has a great offer of kitchen appliances, including fridges with adjustable shelves that can make organizing your food even easier. Where there are kids, there will be mess, so make that mess easier to take care of by choosing surfaces that don’t stain easily. When designing your kitchen, opt for stainless steel or engineered stone for the counters, and linoleum or tiles for the floor. Linoleum might be a better choice if your children are younger as the dishes that fall on it are less likely to break. As for your cabinets, it’s more about the finish than the material – choose darker stained wood, since it tends to hide any potential bruises, dents, and dirt. In order for your children to be able to prepare their own sandwiches, get their own drinks, or just help you with putting the dishes back in their place, they need to be able to actually reach everything. In other words, if your kids are smaller, don’t put their food on the high shelves. If you do need to put some of the things they use higher than they can reach, make sure to get a step stool with anti-slip strips, so they can safely get to every part of the kitchen. Designing your kitchen can be as challenging as it is fun, especially when thinking about the kids as well. However, making sure the kitchen is safe and easy to use for all of your family members regardless of their age will help you not just use it more efficiently but also bond as a family while using it. A good Garbage disposal system can be a lifesaver for the modern mom. Without one, clearing up after meal times can take much longer and be much more intensive process. After slaving away at the stove, preparing meals for your children, it is easy to lose the energy and willpower required to properly clean things up afterward. A garbage disposal makes it as easy as scraping plates clean over your sink and letting the system do the rest of the work. In short, garbage disposals are fantastic, as long as they’re working, of course. One of the most common issues encountered with garbage disposals is that of the blades inside becoming loose. This is an issue that can arise from the wear and tear of normal use and is fortunately nice and easy to fix. The guide below breaks the process down into simple steps that anyone can cope with. Even if you don’t consider yourself a competent DIY enthusiast and wouldn’t usually consider trying to fix something like this yourself, you shouldn’t be afraid of trying. As always, safety is the most important thing! Make sure that you unplug the disposal before your fingers go anywhere near the blades. Garbage disposals are usually plugged in beneath the sink. For many systems, there is a switch that can be used to switch the system off, but if you can unplug it entirely then you should. Once you have done so, try turning it on to ensure that it doesn’t start. Placing a bucket beneath the sink to catch any water that drips out while you are working. It isn’t the end of the world if some water spills, of course, but the bucket will make life easier. You will need a pipe wrench for the next part. First, unscrew the drain pipe from the side. Once you have done that, you then need to unscrew the disposal itself from the drain. Be careful when handling the disposal, as dropping it on your foot could cause injury. It is now time to remove the blades. First, you should unbolt the blades in your garbage disposal. You might find it helpful to use a cloth or towel to help maintain your grip while loosening the bolts. Once the blades have been removed you can then place new ones in and bolt them into place. It is advisable to use stainless steel blades as replacements, as these are more durable and of a generally higher quality. If you are finding that you are having to regularly replace the blades then you should consider whether it might be more appropriate to buy a new, more powerful unit. This guide from mrgarbagedisposal.com can help you to decide which size motor you need for your home. Replacing the blades in your garbage disposal is, fortunately, a simple and straightforward task.